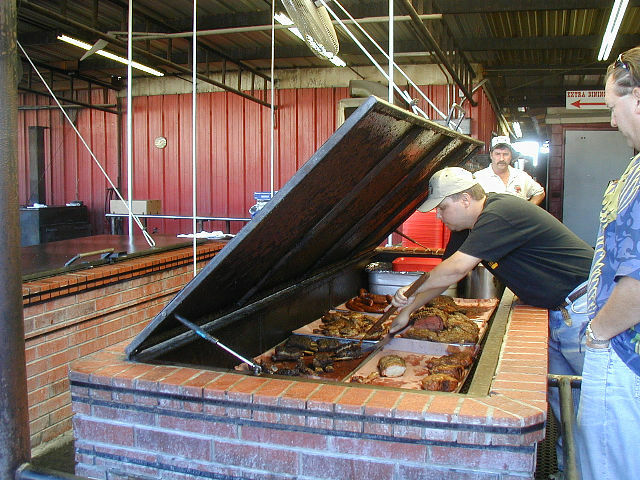 Now that cooler weather has made it down to Texas, we decided to take another trip into the Hill Country. We chose a route with some new stops, as well as some old favorites. 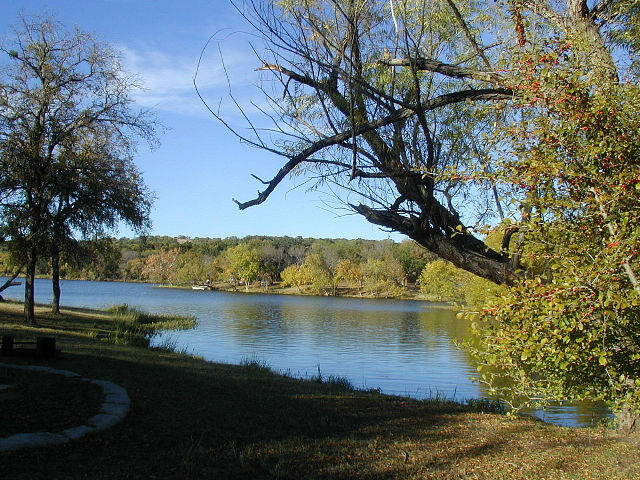 Our new stops included Georgetown and Jim Hogg Park on Lake Georgetown, San Saba, nearby Colorado Bend State Park, and Canyon of the Eagles on Lake Buchanan. The weather was mostly delightful and we enjoyed the colorful fall foliage along the way. We also got to see our first Bald Eagles in the wild on Lake Buchanan. It was a nice trip and we look forward to another RV adventure after the first of next year. [Tuesday] November 11th we got a late start out of Houston. We attended the final Precepts Bible Study class and luncheon at Second Baptist Church - West Campus, and then Kay had a doctor's appointment. We didn't get started until about 2:30pm. My intention was to try to make it to Lake Georgetown before nightfall (about 5:30pm this time of the year). 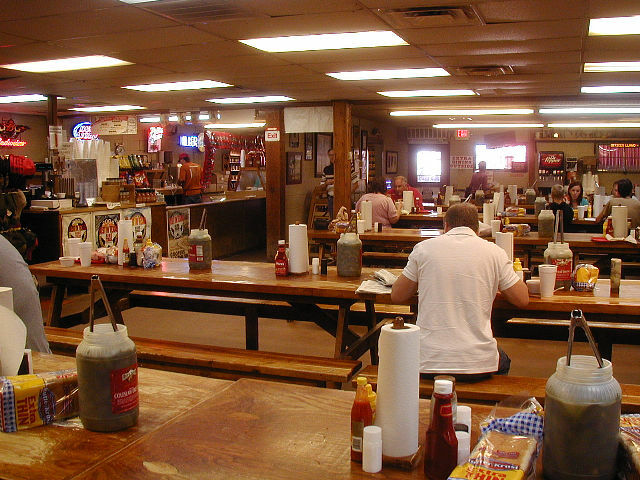 However, by the time we got to Bastrop (via IH-10 and TX-71), I decided it was time to stop. We had never camped at Lake Bastrop, so we decided to give it a try. It was a nice park run by the Lower Colorado River Authority (LCRA). We have had good experience with these type parks in the past. We only spent the one night there, but will try the North Shore Park next time we come through. 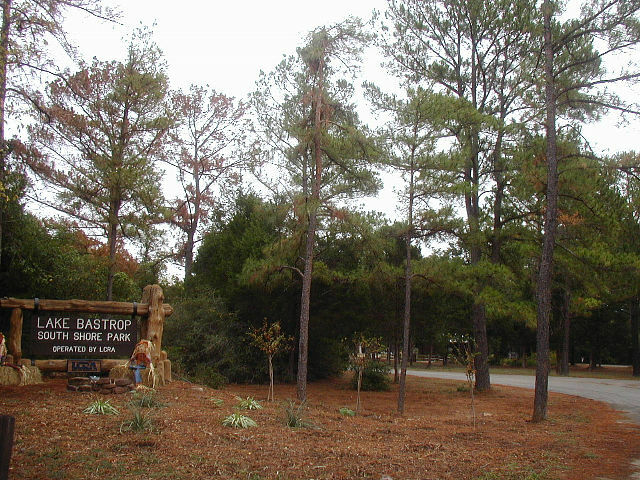 < Lake Bastrop, South Shore Park entrance. [Wednesday] From Bastrop, we took TX-95 north through Elgin and Taylor to Circleville, where we picked up TX-29 west into Georgetown. Lake Georgetown is off Williams Dr. (FM-2338) northwest of town. 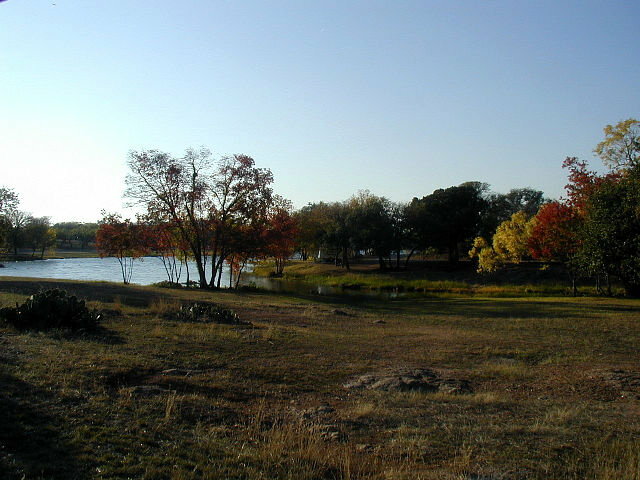 Jim Hogg Park, on the north shore of Lake Georgetown, is operated by the US Army Corps of Engineers. Another Corps park, Cedar Breaks Park, is located on the opposite shore of the lake. Lake Georgetown is a nice lake, but the severe droughts of recent years have drastically reduced the lake's size. We camped in site #36, with a good view of the lake. 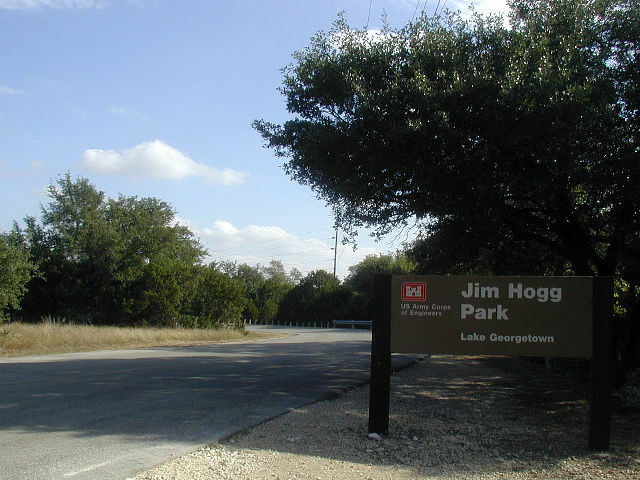 < Jim Hogg Park on Lake Georgetown entrance. < Our campsite. < Sunset on Lake Georgetown. [Thursday] We drove into Georgetown to spend the day taking in some of what Georgetown had to offer. They claim to be the "Red Poppy Capital". We stopped at the Visitor Center and picked up some brochures. We decided to checkout historic Southwestern University first. The University claims to be Texas' first institution of higher learning, chartered by the Republic of Texas in 1840. It is affiliated with the United Methodist Church. The campus has several historic buildings that were interesting to walk through, the most impressive being the Roy and Lillie Cullen Building. 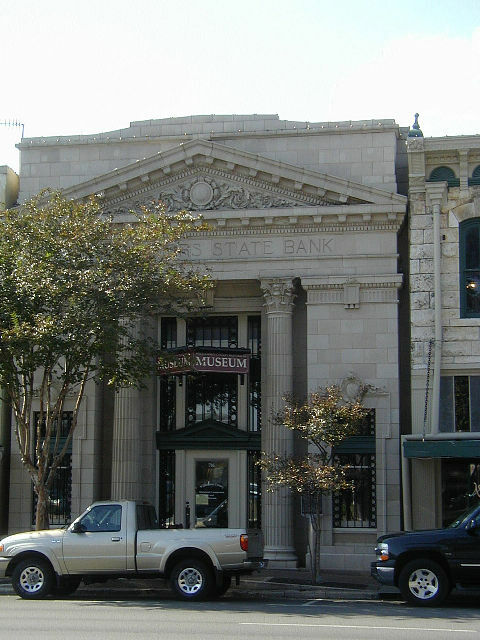 After our "picnic" lunch, we visited the Williamson County Historical Museum, located in the historic Farmers State Bank Building on the square. 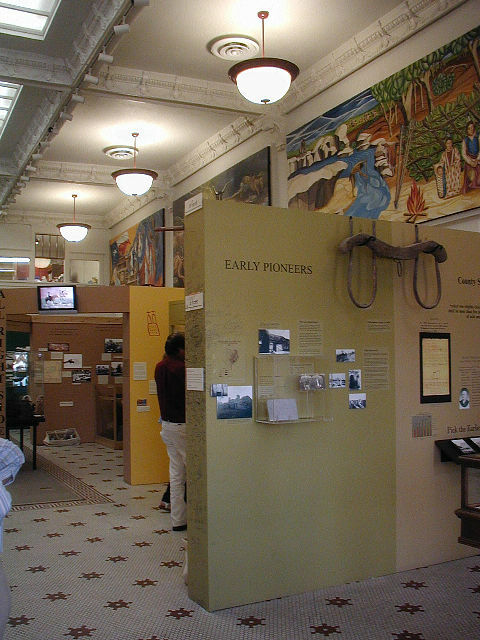 They had informative displays on the early history of the county including the cattle trail drives that passed through the town and gave it a "rough and tumble" cow town flavor. Next we walked through the Williamson County Courthouse. They have guided tours Wednesdays and Fridays - wouldn't you know this is Thursday! We took our own self-guided tour. Afterwards, we drove and walked around the historic district using the map we got from the Visitor Center. 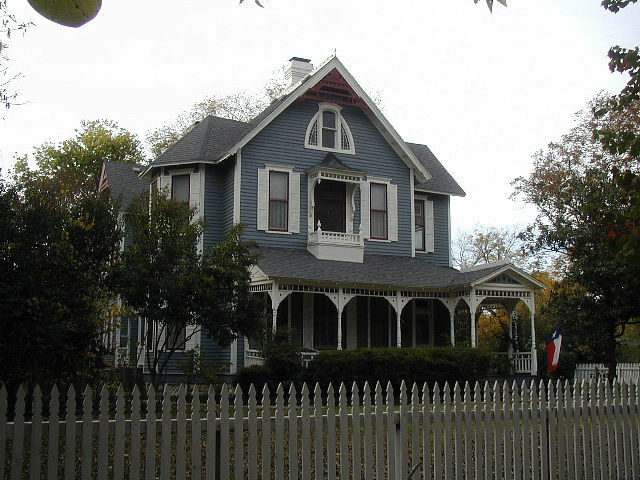 There are many old homes dating from the late 1800's. 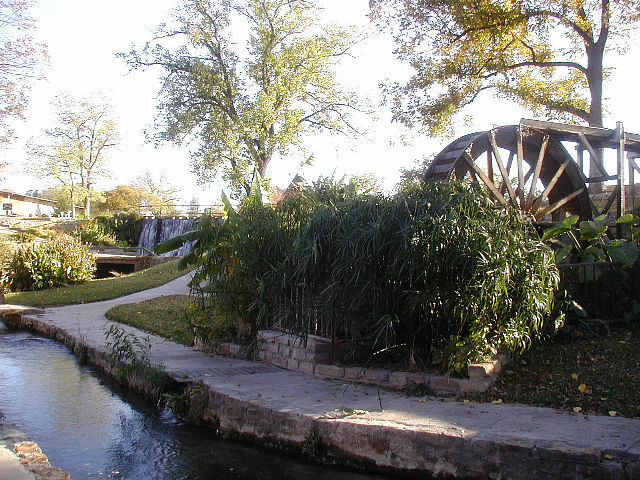 Georgetown has a nice trail system that runs along the banks of the San Gabriel River from downtown, connecting with the trail system that goes entirely around Lake Georgetown. 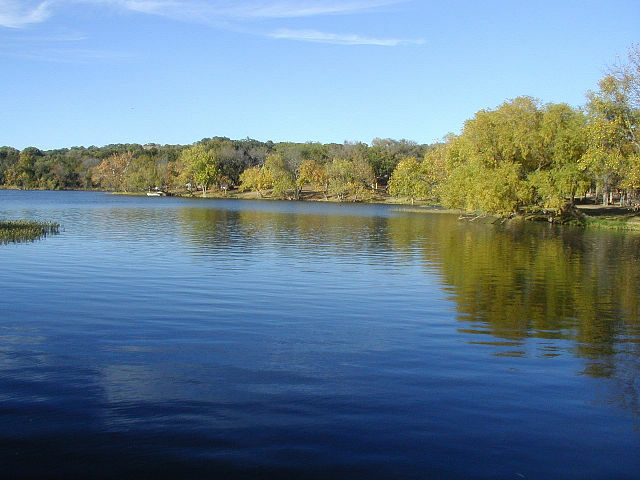 Trails vary in length from 1/2-mile, to the 28-mile loop around the lake. On our way back to the park, we stopped into Del Webb's Sun City - Georgetown to see some of their homes for sale. We wanted to have something to compare to what Del Webb is building in our hometown of Richmond. 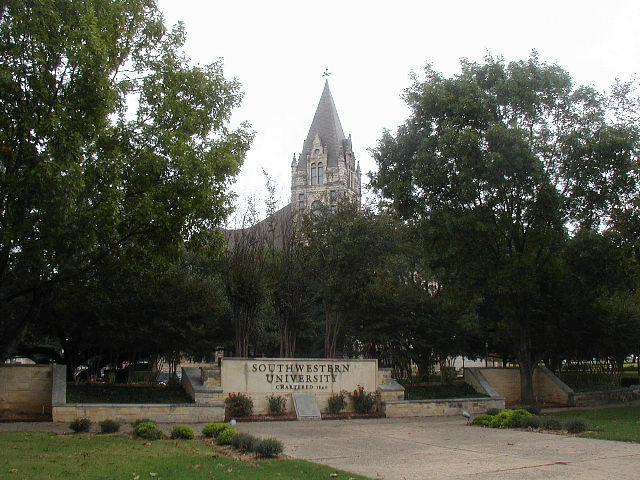 < Southwestern University entrance (Cullen Bldg in background). 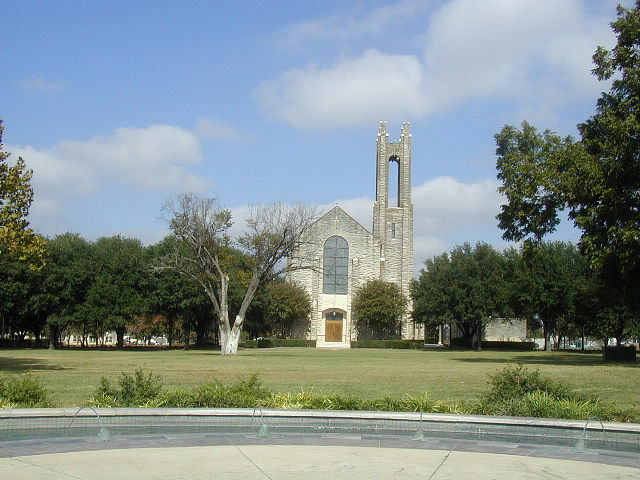 < Lois Perkins Chapel. < Williamson County Historical Museum. < Inside the Museum. 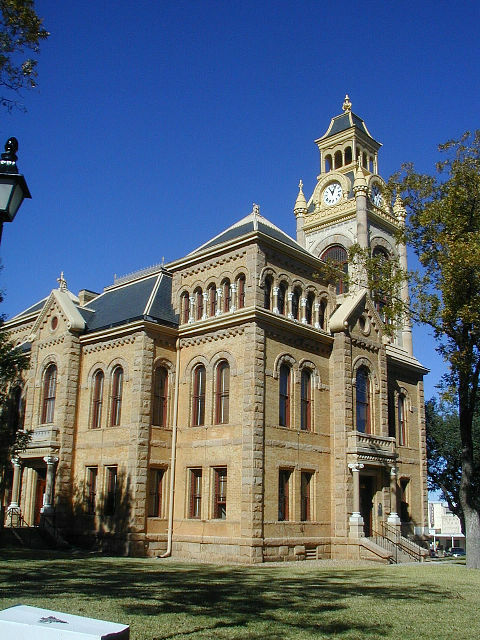 < Williamson County Courthouse. < H.W. Harrell House, ca. 1895-6. 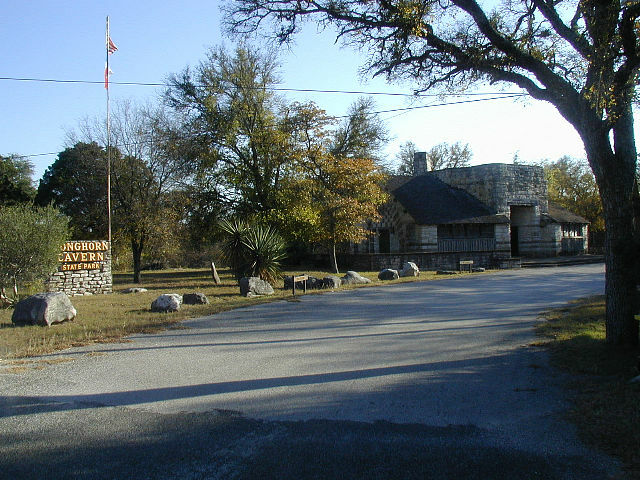 [Friday] This morning we left via FM-2338 northwest to US-183, through Lampasas where we took TX-580 west to San Saba and camped in Joe Ragsdale City Park. The campsites are pretty basic, but have full hookups. 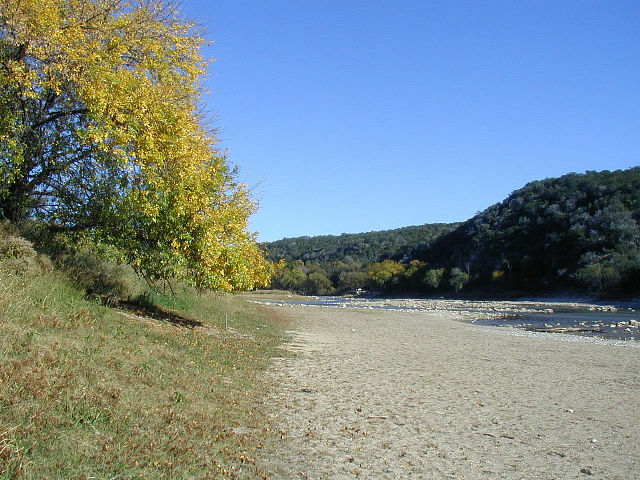 San Saba is the closest town to Colorado Bend State Park, which only has primitive camping. 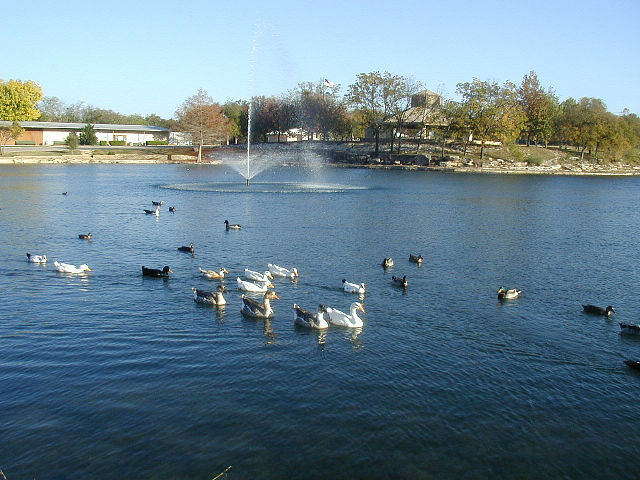 Joe Ragsdale Park is a nice park with a scenic lake and picturesque waterfall and stream below the lake dam. < Our site at Joe Ragsdale Park. < The lake. < Below the lake dam. 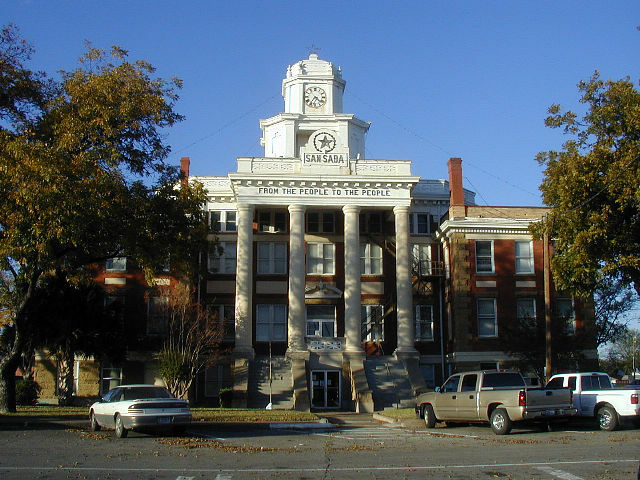 < San Saba County Courthouse. [Saturday] We drove to Colorado Bend State Park. Once you reach Bend, TX you still have 10 miles of dirt/gravel road until you get to the park headquarters. Be prepared to eat a lot of dust. I just don't want to imagine what that road would be like if it had just come a good rain! We learned that they do permit you to bring motor homes and 5th wheel trailers into the campground, but you can only dry camp. They will let you fill your fresh water tank, but that's it. No dump and no electric. I think it is pretty enough to warrant a couple of dry nights, if the weather is good. That morning we walked along the river next to the campgrounds, then along a trail to the River Back Pack Camping Area about 0.8-mile from the headquarters. We also walked a nice trail to the west of the headquarters that went to a small waterfall and pretty green-water pool. After our picnic lunch, we took the guided tour of Gorman Falls. We took the guided tour because we thought we would get some good information from the park ranger. That wasn't the case. And after we arrived at the falls, we found that the falls wasn't flowing due to the drought, beavers building dams along the spring fed stream leading to the falls, and pesty water plants that were using up all the water before it came over the "falls". They said that the falls only flows well in the Spring after some rains. They were trying to get approval to remove the water plants. Anyhow, you can drive to a parking area near the entrance to the park and from there you can take a new trail that goes about 1.5 miles to the falls. 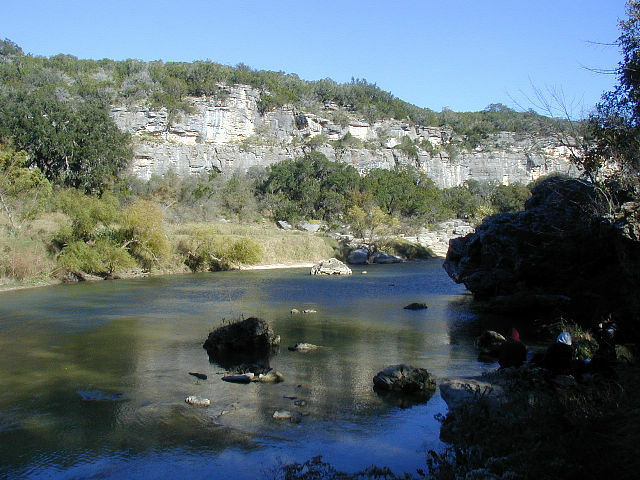 After our hike to the falls, we went back to San Saba. 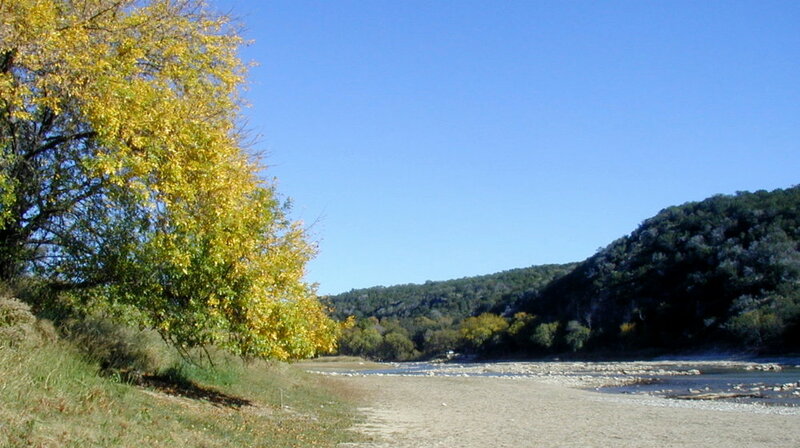 < Colorado Bend State Park along the Colorado River. < Colorado River from a trail. < Colorado River from a trail. < A pretty pool of green water. < Colorado River view. < Kay and Lawson at the "falls". 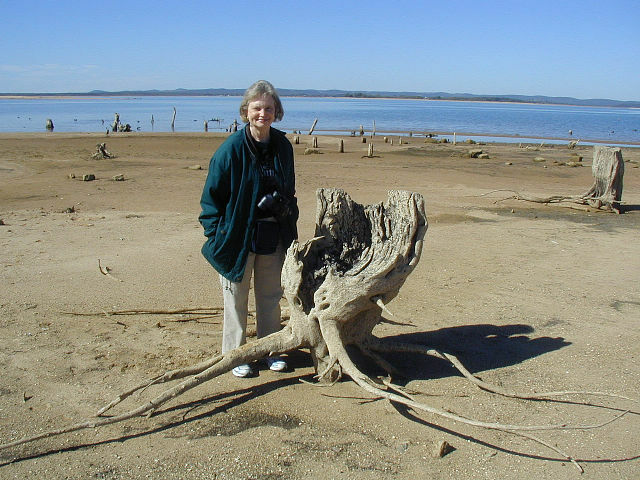 [Sunday] In the afternoon we were to link up with Pat and Annette from our Bible Study class on Lake Buchanan at Canyon of the Eagles, so we left San Saba via TX-16 to Llano. At Llano we took TX-29 east toward Lake Buchanan. 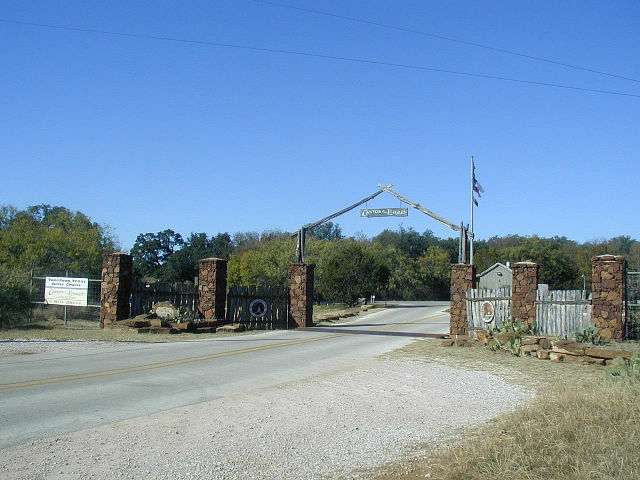 A few miles west of Burnet, we took FM-2341 north to where the road dead-ends into the LCRA facility. The facility contains a concessionaire operated lodge and about 60 motel type cabins and a restaurant. 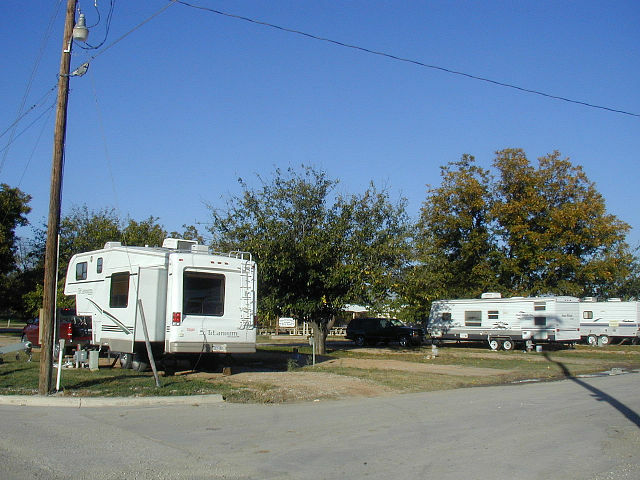 The RV Park is operated by LCRA and is a very nice park with full hookups and good pads. We stayed in site #13 with a peak of the lake through the trees. 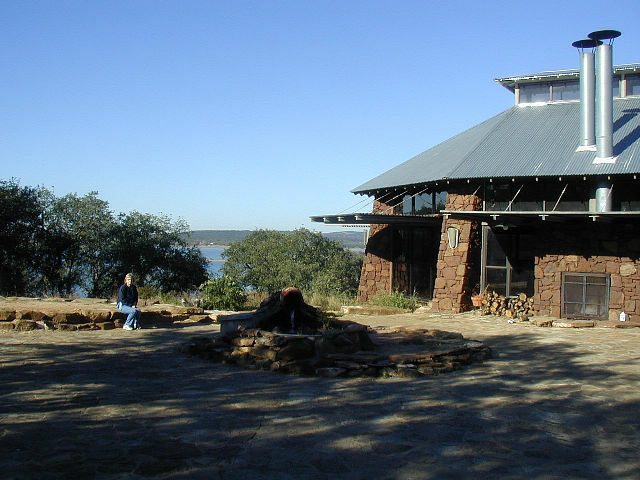 Prior to our friends' arrival at the park, we explored around the lodge and cabins, then walked down to the boat dock where the Vanishing Texas River Cruise departs. When our friends arrived, we visited with them until that night. < Entrance to Canyon of the Eagles. 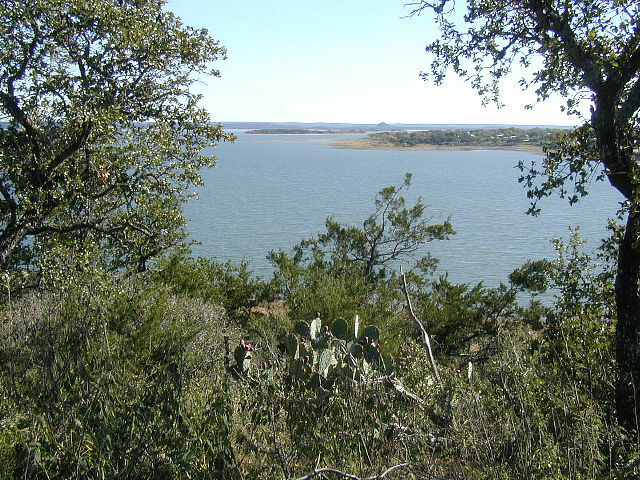 < View of Lake Buchanan from FM-2341. < Canyon of the Eagles Restaurant. 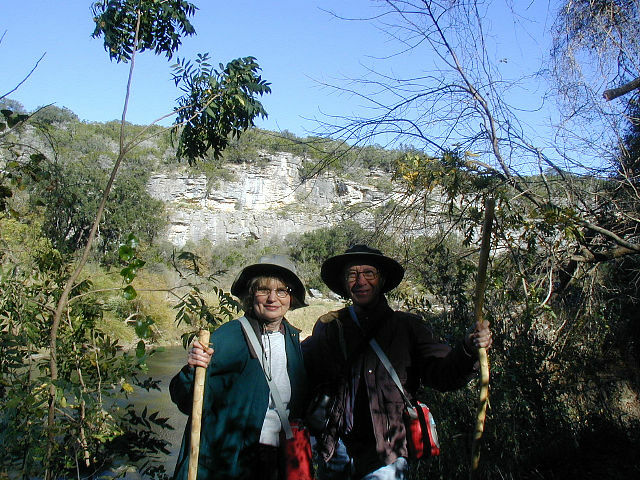 [Monday] We joined Pat and Annette to drive to Llano and spend most of the day there. On the way we stopped at the Buchanan Dam, but found that since 9/11, access to the dam is restricted. In Llano we looked around their downtown square. We stopped at the Visitor Center in the reconstructed train depot. 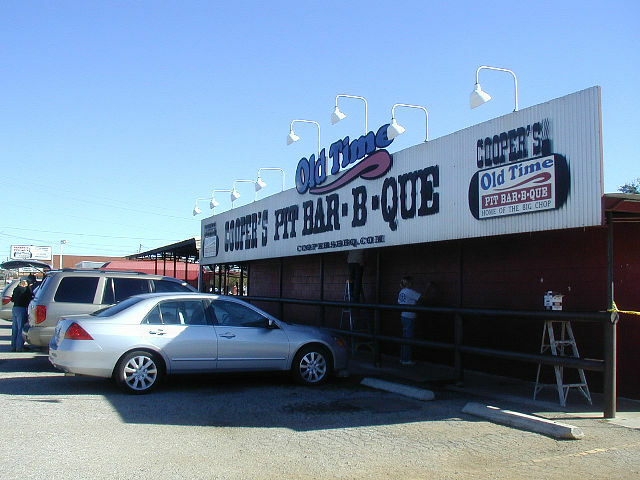 We walked around the Llano River area and then headed for the world famous Cooper's Old Time Pit Bar-B-Que and enjoyed plenty of BBQ, beans, potato salad and coleslaw. After lunch we drove back to the park. In the afternoon we hiked along several of the nature trails in the park. Bald Eagles spend the winter around the lake and they are fairly easy to spot. We spotted a pair flying around as we hiked. 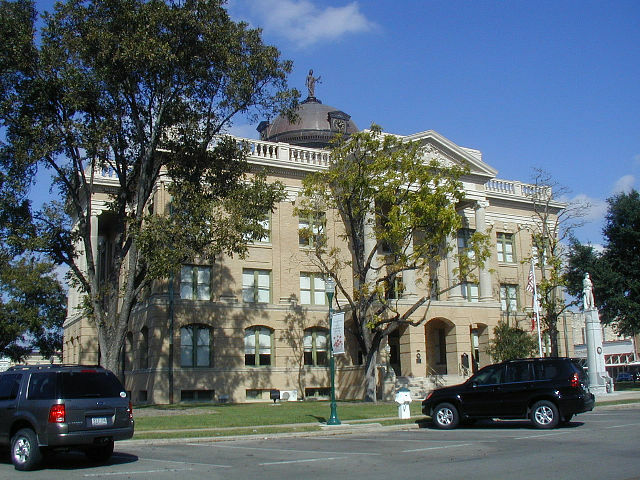 < Llano County Courthouse. 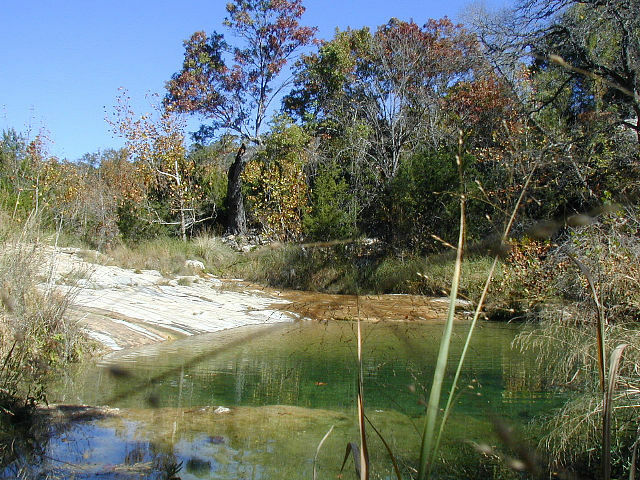 < Low dam on the Llano River. [Tuesday] In the morning we took one of the nature trails for about 2 miles but didn't see anything of great interest. We saw lots of tracks on the trail. The ladies wanted to take a look around Burnet, so after lunch we drove over and did a lot of looking but not much buying. That night we enjoyed dinner with our friends at the Canyon of the Eagles Restaurant. Afterwards, we drove to the on-site observatory and enjoyed viewing the stars and planets through the two telescopes that are manned by volunteers that drive out from Austin several nights each week. Since there were only 6 observers, we got lots of time on the telescopes. The volunteer was excellent. The cold wind soon made us decide the get to a warmer place. We all enjoyed a nice hot cup of chocolate and conversation in the trailer. 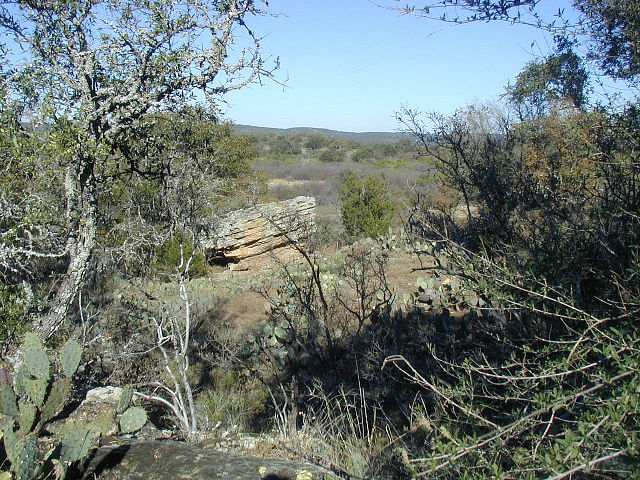 < View on Rocky Point Trail. [Wednesday] This morning we went over to the Canyon of the Eagles Restaurant and enjoyed a buffet breakfast with our friends. 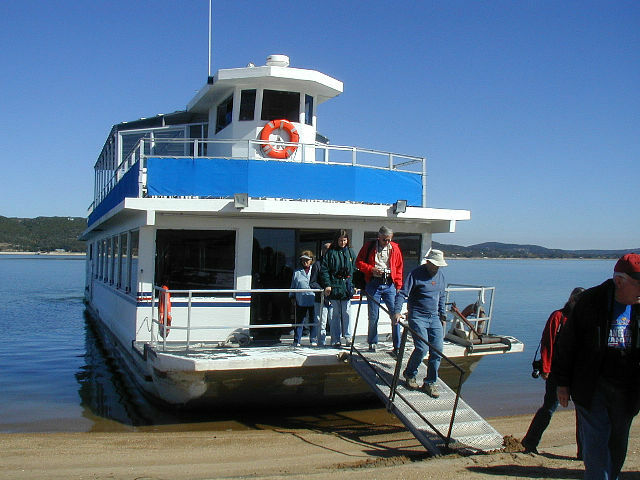 We had reservations today to take the Vanishing Texas River Cruise on Lake Buchanan. Due to the water level being 14 feet low, the boat was not able to go into the Colorado River as it does when the lake is up. The boat left from the dock at 11am and returned at 1pm. We had pre-purchased the box lunches to eat on the boat. While on the boat we got a really good look at a mature Bald Eagle that flew by the boat. In addition to the eagles, we saw an Osprey, Double-crested Cormorants, American White Pelicans and Ring-billed Gulls. We stopped at an island with the remains of a small community that was flooded when the lake was built. 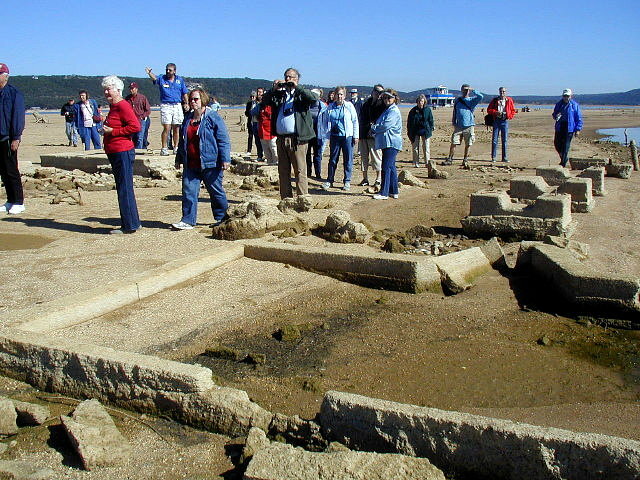 With the low water level now, the remains are exposed. 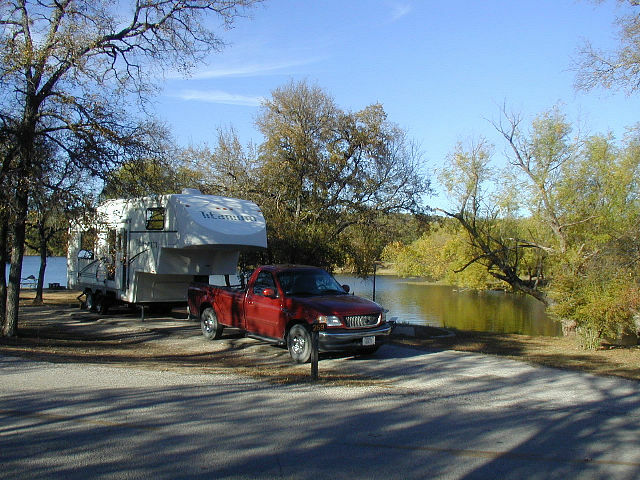 After we returned from the cruise, Pat and Annette went back to Katy and we pulled up camp and moved a few miles south to Inks Lake State Park. 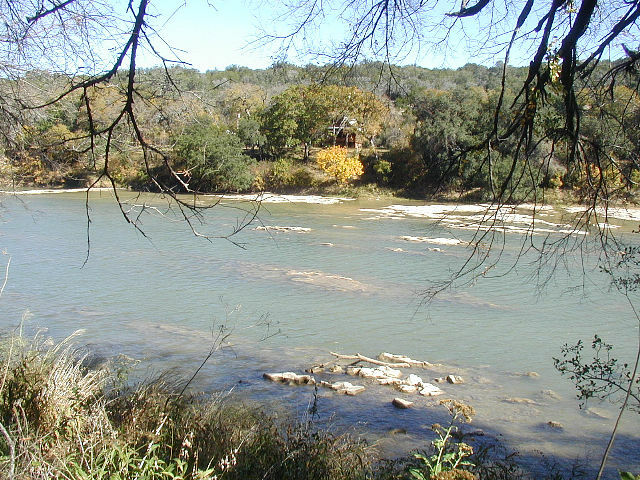 < Vanishing Texas River Cruise. < Remains of flooded community. < Kay with interesting tree stump. [Thursday] In the morning we drove a few miles south on Park Road 4 to Longhorn Cavern State Park. We took the 11am tour and were the only two people besides the guide, so we got a "private tour". 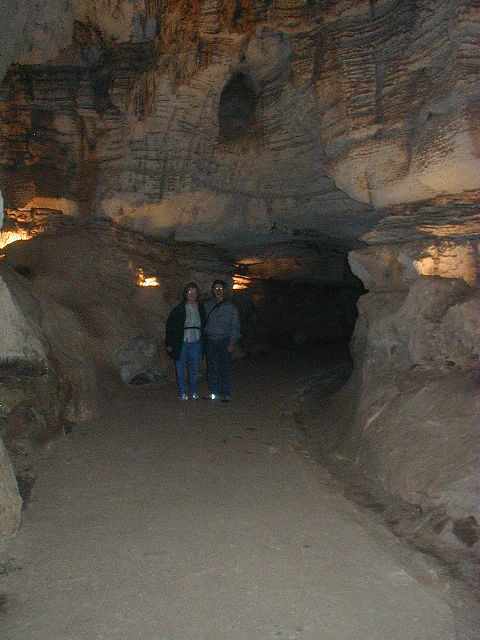 The caverns are interesting and the history also. They are not as colorful as other caverns, but that is due to the fact that water still flows through it when there are large rains in the area. The water destroys some of the more delicate formations. We saw some blind crickets and a few lone bats hibernating on the ceiling. 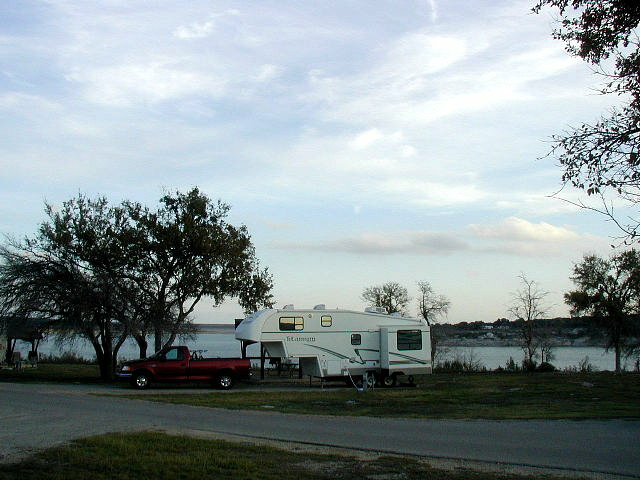 < Our campsite at Inks Lake S.P. 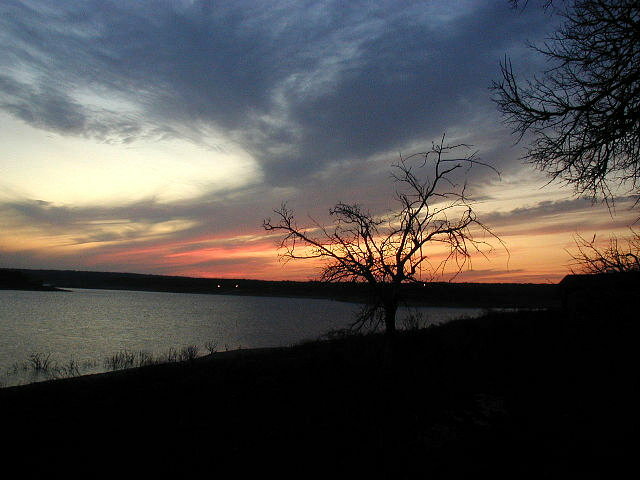 < Views of Inks Lake. 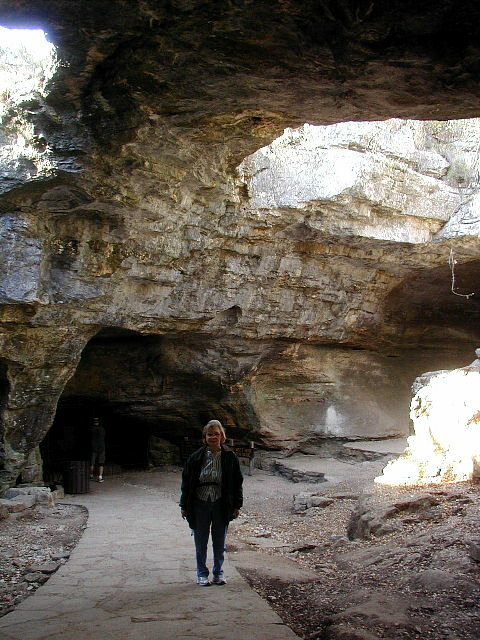 < Longhorn Caverns S.P. entrance. < Inside the cave. < Entrance to the cave. [Friday] During the night a cold front blew through and it got COLD. Also Lawson started coming down with a cold. So we decided that we had squeezed about as much fun out of this trip as we were going to, so we headed back to Richmond. We arrived back home in the mid-afternoon. This draws to a close our visit to the Texas Hill Country. We hope you enjoyed the photos and brief descriptions of our activities. God willing, join us again soon for another RV adventure. Grace and peace to you from the One who is, who was, and who is coming; from the seven spirits before His throne; and from Jesus Christ, the faithful witness, the firstborn from the dead and the ruler of the kings of the earth. To Him who loves us and has set us free from our sins by His blood, and made us a kingdom, priests to His God and Father--to Him be the glory and dominion forever and ever. Amen.